Ark-Klens is a safe effective cleanser, disinfectant and deodoriser and is widely used by veterinary surgeons. Ark-Klens is recommended for the routine safe cleansing and disinfection of feed dishes, bird tables, cages, work surfaces etc. 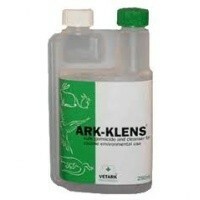 Ark-Klens is also ideal for cleaning the hutch or cages of rabbits, hamsters, vivaria of reptiles and amphibians. For total disinfection, perhaps weekly or monthly depending on the circumstances it is recommended the use of anti-viral, anti-fungal disinfectant Tamodine E after preliminary cleansing with Ark-Klens. For general cleansing and disinfection on a routine basis use at a rate of 10ml/5 litres (1 gallon). Allow a contact time of 3-4 minutes before washing off.